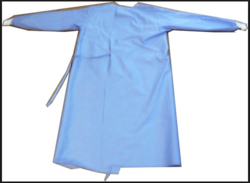 Manufacturer of a wide range of products which include reinforced surgical gown, classic surgical gown, basic surgical gown, premium surgical gown, surgical gown and wraparound surgical gown. We are a coveted manufacturer and supplier of enticing range of Classic Surgical Gown. The surgical gown offered by us is properly designed at our highly advanced manufacturing unit utilizing finest quality material following market defined standards. Offered surgical gown is a tie-round type, which enables to keep the sterility of surgeons back side. 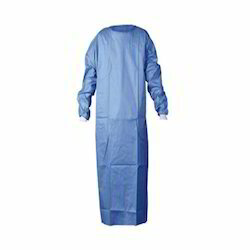 As well, we offered this surgical gown to the customers at market leading prices. Owing to our proficiency in this domain, we are providing Basic Surgical Gown that is resistant to fluids penetration for a short time. The given surgical gown is available in varied customized options so as to meet the needs of clientele. Furthermore, the surgical gown offered by us is checked properly by our quality controllers for supplying defect free range. 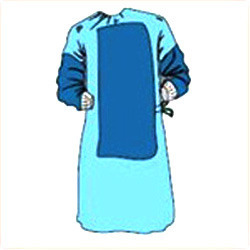 This surgical gown is designed from the quality proven non-woven textile and leading techniques under the direction of experts. Made from hydrophobic non-woven material Sontara with enhanced air permeability. Protects from fluid penetration. Gowns are fixed with four ties system. Sleeves are finished with knitted elastic cuffs. Surgical gowns are a tie-round type, which enables to keep the sterility of surgeons back side. Recommended for long time procedures. Size is available in S, M, L, XL. Backed by skilled professionals, we are engaged in offering an exclusive range of Non Woven Surgical Gown. Our surgical gown is used to prevent direct contact transfer of infective agents from the surgical team. 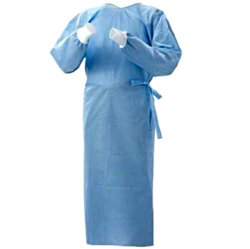 We design this surgical gown using top quality hydrophobic non-woven material Sontara with enhanced air permeability. Along with that, this surgical gown is accessible with us in a variety of specifications as per the demand of our clients.